Resident Foodies say: Bobby Flay scored a huge upset in tonight’s beef empanada throwdown, beating Chef Frank Maldonado of Sazon Restaurant. Maldonado is from Puerto Rico and he opened 6 restaurants in the U.S. in the past 2 years. His empanadas are a huge hit. But Bobby Flay pulled off what may be one of the biggest upsets on Throwdown. Chef Maldonado has been cooking empanadas for most of his life. Bobby learns to make them in a week and then beats Maldonado on his own turf. That’s so wrong, Bobby! In any event, the judges said Bobby’s short ribs in the filling of the empanada put him over the top. They did look good on TV! 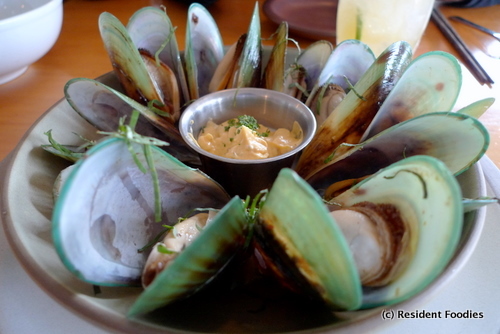 Slanted Door’s chilled greenlip mussels steamed in wine and lemongrass with roasted chili aioli, $12. The plating is exquisite. Taste, just as good!